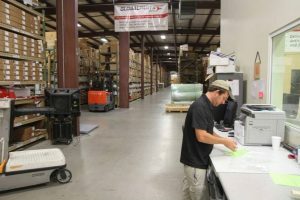 Fourteen years ago, GlobalParts Group started as an aircraft spares and parts distributor at founder Troy Palmer’s home. Today, the company has 105 employees working from its collection of five buildings in Augusta, a facility near Oklahoma City and remote sales offices in Florida and Georgia. In addition to distributing aircraft parts – it carries 135,000 individual part numbers with an inventory that has a market value of $750 million – it has a parts manufacturing operation using three- and five-axis CNC machines and repairs and overhauls aircraft parts, systems and structures under Federal Aviation Administration Repair Station certificates. Most recently, the privately held company expanded into the helicopter market this spring with the hiring of George Canale and Bill Vickers, both of whom are based in Florida and are charged with developing the company’s rotary-wing business. 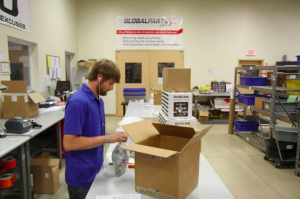 GlobalParts’ growth story, said chief operating officer Malissa Nesmith, has really been about the company being in the right place at the right time, whether it’s to acquire a complementary business that also opens it up to new markets or to hire people who have deep connections in markets that GlobalParts wants to develop further – such as Canale and Vickers. “That is a big growth initiative for us this year, to push into that rotorcraft market … with the experience and knowledge of our two newest members of the company,” said Nesmith, adding that GlobalParts will be exhibiting for the first time at next year’s Heli-Expo national helicopter trade show. GlobalParts got its start in 2003 brokering legacy aircraft parts for then-Raytheon Aircraft. In 2007, when Raytheon sold the airplane manufacturer to two private equity firms, creating Hawker Beechcraft, “we were responsible for direct distribution” of its legacy aircraft parts, Nesmith said. “That’s kind of what gave us this base platform to build off of,” she added. Over time, the company continued to develop additional distribution partnerships with companies such as Zodiac Aerospace and GKN Aerospace as well as local parts and spares manufacturers including Mid-Continent Instruments, Electromech Technologies and Lee Aerospace. The parts it distributes vary from aircraft instruments, engine accessories, windows, landing gear, fire extinguishers and batteries. 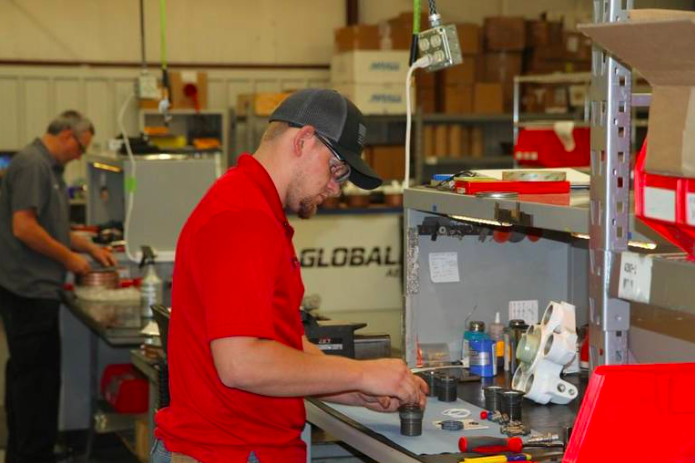 GlobalParts has 11,000 customers in its database and does business in 72 countries, said Brad Vieux, GlobalParts vice president of business development and international relations. Parts are available from its website, globalparts.aero. He agrees that the company has been opportunistic in its growth. Between 2009 and 2011, during the recession, “everybody was trying to liquidate their inventory, and we were buying it,” Vieux said. 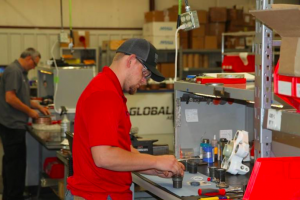 In 2014, GlobalParts was presented with yet another opportunity that would further expand its repair and overhaul business through the purchase of the assets of Tulakes Aero in Bethany, Okla., near Oklahoma City. That acquisition gave the company the ability to repair and overhaul larger structural parts of airplanes, including wing, tail and fuselage components, as well as a second FAA Repair Station certificate. Earlier that same year, it bought the type certificate, intellectual property, tooling and assets of the Meyers Aircraft Model 200 airplane and formed a subsidiary, Interceptor Aviation, which supplies parts and customer support to Meyers Aircraft owners. Nesmith said there are about 60 active Meyers aircraft in operation. At one point, GlobalParts was considering reviving full production of the airplane. “That kind of got put on the back burner,” she said. That’s because the company had a more immediate deal in the works a year later that was a higher priority. In late 2015, GlobalParts struck a deal with Bombardier Business Aircraft to take over the distribution, stocking and planning for Learjet 20-, 30- and 50-series business jets, which were manufactured roughly between the 1960s and early 2000s. Even though those Learjet models are no longer in production, about 2,000 of them remain in service. The deal was a welcome one for GlobalParts, but it also meant a lot of work preparing for and fulfilling the new business. For their part, Bombardier officials said GlobalParts had the experience and the “extra services” – manufacturing and repair and overhaul – to support its customers who had older Learjets, Bombardier Business Aircraft spokesman Mark Masluch said. The GlobalParts agreement is “a great extension of all of the services we offer,” Masluch said. “At the end of the day, it’s a very win-win arrangement for GlobalParts, Bombardier and our operators of the Learjet 20-, 30- and 50-series aircraft,” Masluch added. As for what’s next for GlobalParts, it could be centered around the Meyers airplane, even though “we haven’t moved forward on earning a full production certificate at this point,” Nesmith said. “We are working on an STC (supplemental type certificate) for the existing fleet,” she said, declining to offer further details.